Living a Fit and Full Life: Get the Cleaning Power You Need with Brillo Steel Wool Soap Pads and Sponges! Get the Cleaning Power You Need with Brillo Steel Wool Soap Pads and Sponges! Brillo®, the original steel wool soap pad, is one of the most trusted names in household cleaning - and has been for more than 100 years. Today, the company provides a wide variety of household cleaning products including polyester Brillo® Estracell® sponges, Brillo® Erase & Wipe and the Brillo® Sweep & Mop. Brillo® remains dedicated to one ideal... helping people everywhere to enjoy clean, healthy lifestyles. Setting the standard for clean, Brillo® Steel Wool Soap Pads are America's favorite and recognized around the world for cutting through the grease and grime of everyday living. 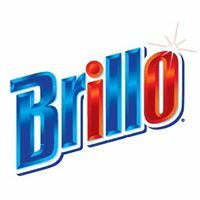 With our proven, original formula loved by generations, Brillo offers a full selection of products designed to give you a brilliantly clean home. Brillo® Estracell® No Scratch Scrub Sponge with Wedge Edge® is a thicker sponge ideal for bathrooms. With a patented shape that reaches deeper into hard-to-get-to corners and crevices on most surfaces, it's great for removing build up in hard to reach places on sinks, bathtubs and all around the bathroom. The Estracell sponge side reaches in and easily wipes up and rinses dirt and soap scum down the drain. 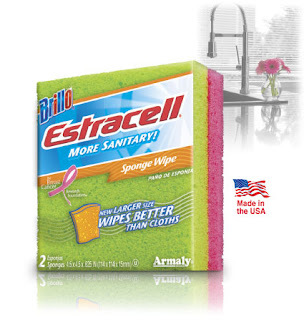 Brillo® Estracell® Sponge Wipe is an effective cleaning tool for around the house. Use it instead of your dish sponge or cloth to wipe tables and counters and help prevent cross contamination. 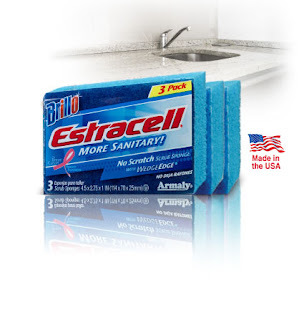 Brillo Estracell Sponge Wipe will easily wipe up and rinse dirt and food particles down the drain. Brillo® Estracell® No Scratch Scrub Sponge with Wedge Edge® is a multi-surface scrub sponge with a patented shape that reaches deeper into hard-to-get-to corners and crevices on most surfaces. Great for removing build up in hard to reach places on your stove, around your sink, bathroom and all around your home. The Estracell sponge side reaches in and easily wipes up and rinses dirt and food particles down the drain. Use it too on non-stick cookware. To use, wash the utensil or surface in hot, sudsy water and rinse. Sprinkle Cameo on evenly while surface is still wet to form a paste over the entire area. For stainless steel appliance surfaces, combine Cameo with hot water to make a paste. Using a damp Estracell sponge, rub gently with the grain of the surface, until the color and luster return. Immediately wash utensil or surface again in hot, sudsy water. Rinse thoroughly and wipe dry immediately. Get the cleaning power you need with Brillo Steel Wool Soap Pads and Sponges! One thing I remember from my childhood is my mom using Brillo Steel Wool Soap Pads on her pots and pans. They literally made her pots and pans look like brand new and took off all the burnt on mess with ease. 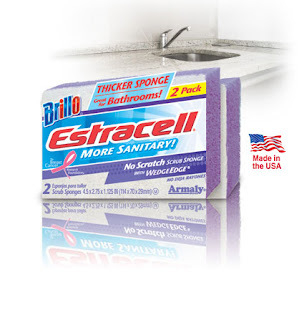 Brillo® Estracell® No Scratch Scrub Sponge with Wedge Edge® is a thicker sponge ideal for bathrooms. I love how well it gets into corners and how perfect it is for cleaning sinks, tubs and showers. Brillo® Estracell® Sponge Wipe is the perfect sponge for in the kitchen! I love how well it cleans up spills and wipes down counters. It's a great way to keep your kitchen in tip top shape! Brillo® Estracell® No Scratch Scrub Sponge with Wedge Edge® is a great sponge for cleaning up around the house and is perfect for any job. I love the Wedge Edge for getting into corners and cleaning where most sponges can't. 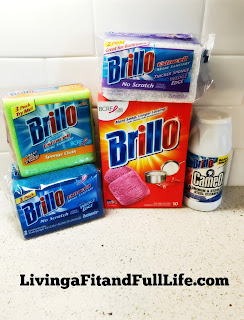 Brillo cleaning products are exactly what you need to get your home sparkling clean! 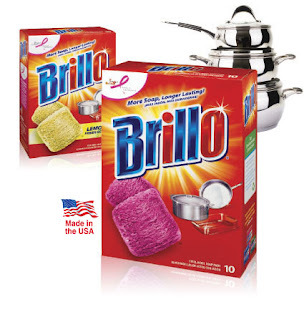 Click HERE to find a store near you that sells Brillo! Click HERE to learn more about Brillo! Follow Brillo on social media!